To celebrate the launch of our summer issue, Future Shock and the Barbican's Digital Revolution next month, we're devoting a day to the brave new world of digital. From the future of smell to radical Oculus Rift collectives, check back here throughout the day for more mind-bending glimpses into the future. The thought of losing a limb is not something most of us would consider. Having to replace an amputated part of our body with the same lifeless, synthetic slab of silicon used to make dildos would make most of us cringe and fall into an empty pit of grief for our departed fleshy member. Long gone are the days of inert, slabs of plastic digits and motionless chunks of faux-flesh with Sophie de Oliveira Barata and her Alternative Limb Project, which is helping amputees to focus less on their disability by forging an entirely new frontier in personalisation through the bespoke customisation of her client’s passions and deepest desires. Her intimate studio opens a world of opportunities and possibilities for amputees in a time when most would have lost hope. 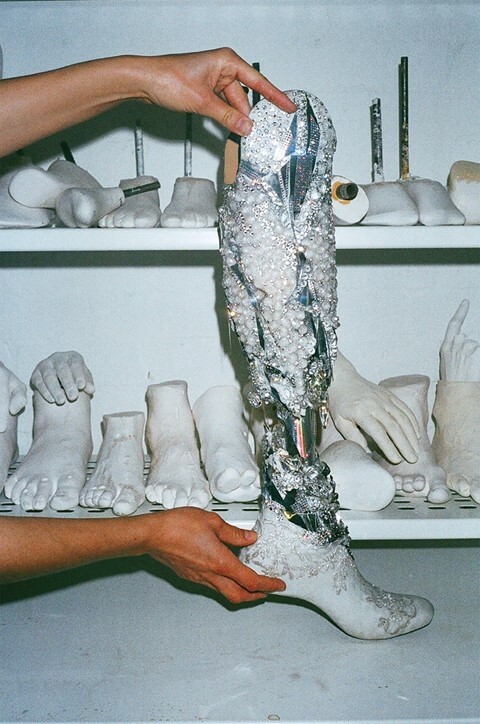 Interpreting her client’s ideas, Sophie creates extremities and limbs to inspire and empower the wearer. "A fisherman once wanted an arm with a rod attachment and drawers to keep his bait inside. I loved this idea; unfortunately, he never went through with it. I ask the client to come to the consultation with images of inspiration. These could be of anything – in fact, the more random and abstract the better – whether it’s an image of a fish to one of a car-engine part. To be able to customise the things we love around us brings a sense of ownership, individualism and personal connection. Once the concepts and ideas are formed, we take casts and scans, working to individual needs. I once made a realistic looking leg for a lady who lost hers due to circulation problems. Colour matching the various skin tones was a real challenge as her other leg kept changing colour constantly. The result was wonderful one minute, then off the other. It was quite odd seeing her real leg transforming before our eyes, camouflaging in and out with the fake one. I find robotics an exciting pathway as we can incorporate electronics into the limbs, not only alternative in style, but in function also. However, Sophie draws the line at genital and fetishised prosthetics. I specialise in sculpting silicone and we are open to many ideas lead by the client’s imagination, though we won’t make anything we believe to be in poor taste or overtly offensive."